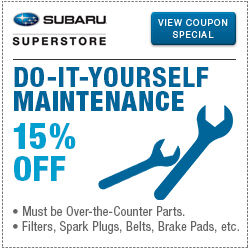 It's no secret: you love your Subaru and we love helping you keep it running and looking great. When it's time to upgrade your vehicle with Genuine Subaru Parts and Accessories, come see the pros at the Subaru Superstore Parts Center. We have an extensive selection of parts and accessories in stock, designed specifically to fit your Subaru, at great prices. 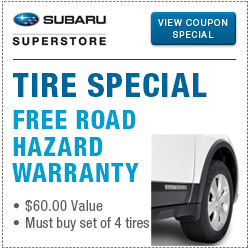 Subaru Superstore is pleased to offer these incredible, money saving monthly specials. Feel free to click on any of the individual specials, call us at (888) 264-4068 or visit us at 1050 S. Gilbert Road, Chandler, AZ 85286 for more information. Our friendly and knowledgeable parts professionals will be happy to assist you in finding the part or accessory that's a perfect fit for both your Subaru and your budget. We look forward to serving you at Subaru Superstore! When you're Arizona's #1 volume Subaru dealer, you know a thing or two about value and we understand that our customers are the real #1. We sell more for less and that includes Genuine Subaru Parts and Accessories. 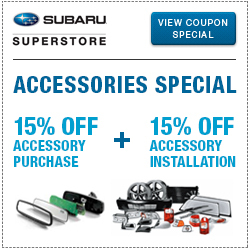 Subaru Superstore should be your first choice for all your Subaru parts and accessories needs. Be sure to take advantage of these incredible deals and check back next month for more. We look forward to serving you at Subaru Superstore!